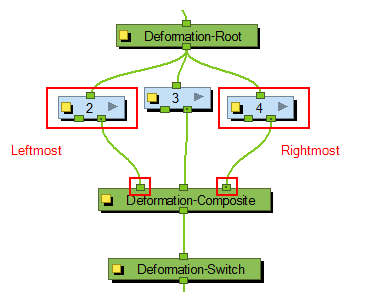 The Deformation-Composite node is automatically added to a rig when creating a split deformation chain. It is used to link the different nodes of a split deformation chain together before deforming the drawing it is linked to. You can customize its parameters to influence the result of the combination. Output Kinematic Only This option is disabled by default, allowing the deformation chain to output deformation and position information. This option should be enabled in order to output the chain information position only. This will allow you to connect a part to the hierarchy without it undergoing the deformation applied to the rest of the chain. This option is important if you have several deformation chains for one element, as in the case of a character with multiple poses. • When this option is enabled, it will only use the selected chain, which you will be able to define in the Output Kinematic Chain options of the Deformation-Composite. In some situations, this option is enabled and setup automatically (For example, when you are working with the Create Posed Deformer in Create Deformation Above/Under enabled)—see About Multi-pose Deformation Rigs (Transformation Chains). • When this option is disabled, all the different chains for this element will be used at once. 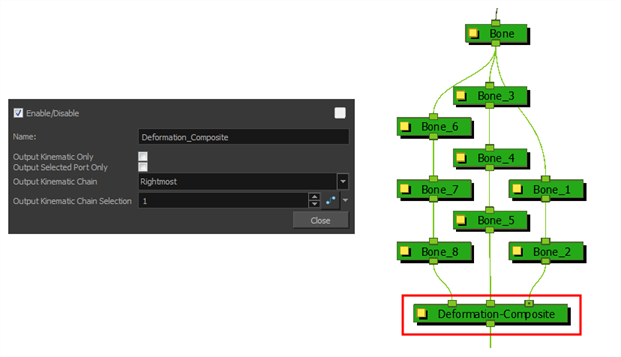 Lets you select a deformation chain option to use. This parameter is used when the Output Selected Port Only option is enabled. Rightmost: Only the first chain connected to the right of the composite node will be used. Leftmost: Only the first chain connected to the left of the composite node will be used. Select: If you select this option, you can define which chain to output according to the order they are connected from left to right. Use First Connected Element’s Exposure as Key: Allows the deformation effect to automatically detect which deformation chain to use (subgroup) by detecting the exposure of the first element connected to the deformation. This option is used in the case of a multiple pose rig—see About Multi-pose Deformation Rigs (Transformation Chains). When the Output Selected Port Only option is selected AND the Select option is used as the Output Kinematic Chain setting, this field defines which deformation chain you want to use on your element. 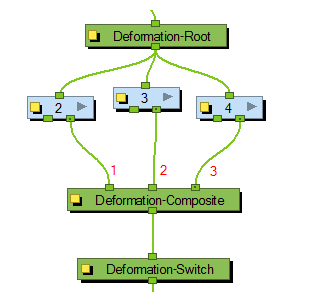 Select the number which corresponds to the left to right order that the chains are connected to the Deformation-Composite node. You can attach this value to a function and enable different chains over a period of time on specific frames. This value can be modified in the Timeline view by using the Deformation-Switch layer. Since the Deformation-Composite node is only visible in the Node view, the layer has a reference to this parameter enabling you to easily edit the value when working in the Timeline view.